fuse traditional needlework techniques with graphic, contemporary designs to timeless effect. 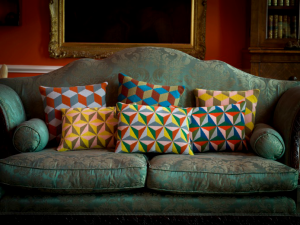 combinations including mixtures of pink, blue, chartreuse and red, alongside softer grey tones. of the selling price of their completed projects. & Hall, 17 Rugby Street, London WC1N 3QT during the London Design Festival in September 2014.